I decided that I need to start doing a little sewing for myself. The kids pretty much have everything they need right now but my wardrobe - especially my casual wardrobe, is severely lacking. The first thing I decided to make was a fleece zip-up jacket. In the winter time you can often find me wearing a fleece jacket at home, and, of course, a fleece jacket is a great casual jacket for spring and fall. Unfortunately the one I had been relying on has seen better days, so it was time for a new one. I didn't want a boxy jacket, so I looked for a pattern that had princess seams to give it shape. I decided on the Jalie 2795 Jacket. 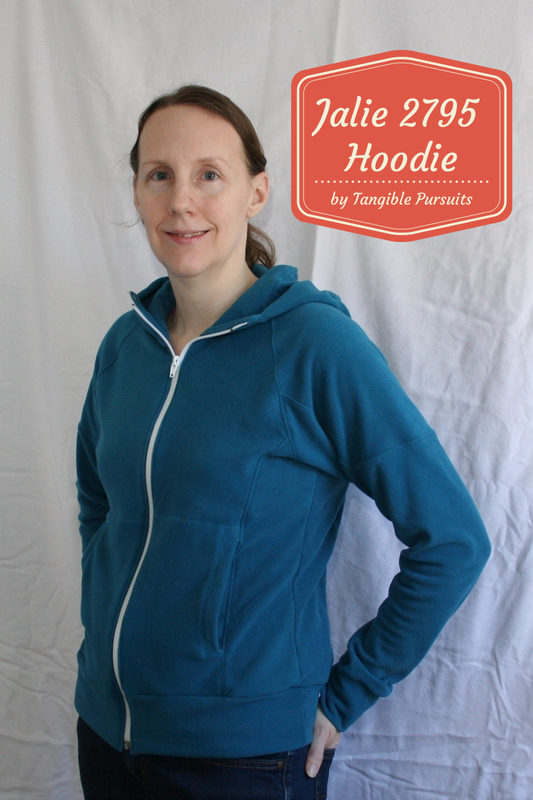 I like that it has both hood and non-hood options and includes sizes 2 through women's sizes, so I will be able to get lots of use out of it. I got the fabric from the $1/yard barrel at the fabric store near I work. It is a lightweight fleece - more like a microfleece - and has a great soft texture. I love the rich teal color - it is one of my favorite colors. There are a lot of pieces to the pattern (there are three pieces for the sleeve, for example), so tracing the pattern and cutting out the fabric takes some time, but the pattern comes together pretty easily. The instructions are not the most detailed, but the illustrations are clear. When I had problems understanding a step, reading through the next few steps helped me understand what was supposed to happen in the step I was stuck on. For example, with the welt pockets, at first I didn't understand why the welt was shown as not going all the way to the edge of the front piece, but then, after reading the next couple of steps, I realized that there had to be a space so that when I was sewing the front piece to the side piece the welt wouldn't get sewn in as well - closing up the pocket opening. I sewed everything together with the serger and did the top stitching with my sewing machine, which involved a lot of back and forth, but it was worth it - I don't think anyone would ever guess that I made this jacket myself. This is definitely going to be my new go to jacket for taking the chill off on chilly winter mornings. And I plan to sew up a few of these for my nieces as well. But, I definitely have more sewing for myself in store too. I have been building up a little stash of fabrics for me and it is time to start cutting into them! You really did an amazing job on this Emily! It turned out perfect! Thanks! It was definitely a staple in my winter/spring wardrobe.